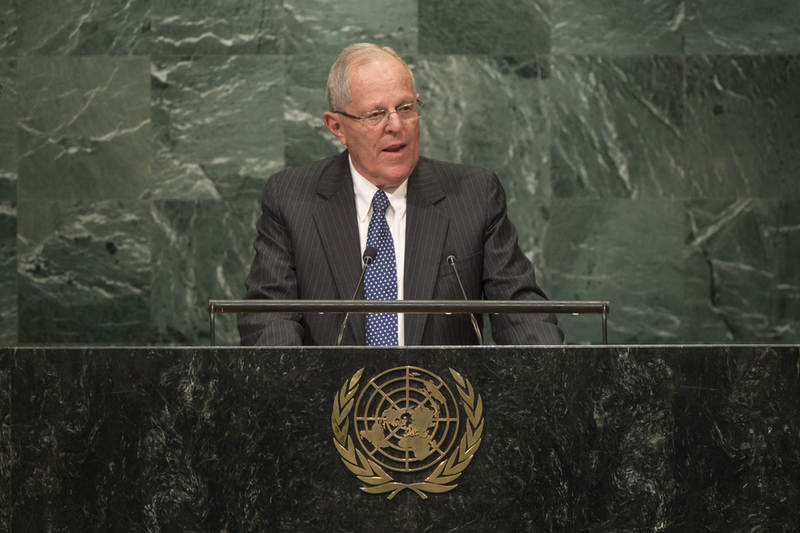 PEDRO PABLO KUCZYNSKI GODARD, President of Peru, said that his country’s public policies incorporated the 2030 Agenda, including ensuring access to water, education and health care for all Peruvians. Such policies would drastically reduce poverty. His Government had also waged an all-out battle against corruption and drug trafficking, and was working to guarantee water and sewage access for 10 million people, almost a third of the country’s population. He pledged a significant investment for the Amazonian and non-urban areas and to implement systems for rain water collection. In that regard, integration and collaboration with the United Nations was a top priority, he emphasized, noting the success of a recent top-level meeting on water he had just participated in. Peru was particularly vulnerable to the effects of climate change, especially with the melting of its glaciers in its mountains. His Government had a clear vision of the new challengers and responsibilities that it must grapple with, and it welcomed partnerships with other neighbouring countries to tackle the many challenges of development. Fundamental freedoms and the right to participate freely in political life, along with the checks and balances of power, were critical pillars of Government, he stated, adding that he also respected the principle of non-interference in international law. There was concern for the critical political and economic concerns that currently faced all of Latin America. In Venezuela, social and political instability must be tackled by an internal, political dialogue in the context of full respect of the national Constitution. His country would stand by to assist “our Venezuelan friends” in any way to bring about a resolution. In addition, he welcomed the recent peace agreement in Colombia. The Government in Peru was also working towards modernization in line with the United Nations goals and efforts. “We live in different parts of the world and are experiencing a loss of confidence,” he said, emphasizing that the unprecedented wave of refugees must be dealt with humanely. “We are betting on a creation of South America and Latin America as a peaceful bridge,” he added.